Boiceville — Onteora Central School will present, “There and Back,” an informative and motivating presentation on drug and alcohol abuse, at 7 p.m. on October 25. The presentation will take place in Harry Simon Auditorium at the High School/ Middle School. In high school Ken Bartolo was a stand out athlete Jamesville-Dewitt, but after suffering an injury and being prescribed pain killers he fell victim to an addiction that would control the next 27 years of his life. MONTICELLO — Friday afternoon, Ken Bartolo, stood before more than 1,000 students, teachers, and other staff members inside the auditorium at the Monticello High School (MHS) to deliver a speech that would move many to tears. Attending Jamesville­Dewitt High School, just outside of Syracuse, Bartolo was a star athlete playing both lacrosse and football. He had big dreams for his future, always knowing he wanted to be a Division I athlete. On Dec. 4, high school students at RSCS gathered for an inspiring and informative presentation of how alcohol and drugs can lead to the horror of addiction and shatter dreams and family. Presenter Ken Bartolo attended high school at Jamesville-DeWitt High School where he excelled in both football and lacrosse. Colleges and universities were following his successes in high school sports offering scholarships and incentives as early as his junior year if he would sign to play for them after high school graduation. “In high school it seemed that the students that were the most popular and “cool” also smoked “weed” (marijuana) and did drugs,” Bartolo told the high school students at RSCS at an assembly. “I had everything going for me but I also didn’t think much of myself. Inside I believed I was a loser.” In a high school lacrosse game he was injured and his doctor treated him with painkillers. Thus began 27 years that included substance abuse, three years in state prison, addiction to prescription drugs, cocaine, heroin, and alcohol. “At 26 years old the two things I loved to do, play football and lacrosse, were ruined because I was drinking, popping pills, and doing cocaine,” Bartolo told the students. “My coaches recognized I had substance abuse problems and tried to help. Eventually I washed out of colleges and then other colleges recruited me and I would play for them. I continued to smoke crack, drink, and spend time in detox and rehab centers. I would be clean of drugs for ten months and then begin again. I believed I was a “nobody”; I didn’t matter and was a loser. Despite everyone telling me I was Mr. All-American Athlete, inside I didn’t like myself and turned to drugs. Even when I ended up in prison there was heroin inside prison waiting for me. Ken Bartolo spoke at Memorial Chapel last week in hopes of making a difference in the way Union’s student body views the dangers resulting from alcohol and drug consumption. POLAND – When speaking recently to Poland Central School District students about overcoming 27 years of substance abuse, Ken Bartolo described in detail how sports presented him with many opportunities in life that he threw all away with drugs and alcohol. He then spoke about how his addiction to drugs and alcohol ruined his own dreams. Bartolo delivered his “There and Back” speech at Herkimer College on Tuesday. The speech covered his 27 years of substance abuse and his road to recovery. Bartolo was a two-time All-County athlete in football and lacrosse at Jamesville-Dewitt High School, and was receiving scholarship offers from colleges and universities. By that time, however, drugs were starting to take over his life. He said he was suspended from school and kicked off the football team after he was caught doing marijuana. “That was my first hit of marijuana and I had lost my first dream,” he said. Bartolo said he became addicted to prescribed medicine, including Percocet and Xanax. Later, he would start abusing cocaine, though he said he thought he would only do it once. “I had no idea it would take me 10 years to put that dollar bill down,” he said. Even when he found himself playing professional lacrosse in Rochester, another dream of his, Bartolo said he turned to drugs instead. “My dreams took a backseat to doing cocaine, popping pills and drinking,” he said. Bartolo said he ended up panhandling at bus stations and on the streets in Syracuse. He said his addiction damaged his relationship with his family, including his son who he passed up a visit with because he wanted to feed his drug habit instead. Bartolo said his addiction caught up to him and he ended up in state prison for three years. After prison, Bartolo said he had made the decision to get off drugs. One day, when Bartolo was at the Rescue Mission, he decided to pray. Bartolo thought of a friend who was also recovering from drug abuse who helped him with his own recovery. He got in touch with the friend and told him he had lost his family from his drug abuse. “He said, ‘Of course you did, son. That’s what addiction does to families,” he said. Bartolo said he participated in various recovery programs — including a 12-step program — and he said it took about six months before he started to “feel good” again. Through his rehabilitation, Bartolo said he learned to start helping people, doing things for others and to be a good example. “My life is more wonderful now than it ever was as a teenager,” he said. Bartolo’s There and Back organization is “dedicated to reducing drug and alcohol abuse among students from elementary school to college, with an emphasis on student athletes,” according to its website at www.kenbartolothereandback.com. Bartolo said he’s been giving his motivational speeches for about a year. Herkimer College athletes attended the event, along with students in other classes and members of the public. The college’s departments of admissions, athletics, counseling and the Center for Student Leadership and Involvement sponsored the event. High school students from the Central Valley, Herkimer, Herkimer BOCES, Little Falls, Mount Markham, Owen D. Young, Remsen, Sauquoit and Whitesboro school districts attended Bartolo’s speech Tuesday morning, where they had a chance to ask questions regarding his addiction and recovery. “There and Back” is the chilling story of two-time all-county and collegiate football and lacrosse star Ken Bartolo and his addiction with alcohol and marijuana. While starring in both sports at Jamesville-Dewitt High School, his addiction began costing him scholarship offers. Bartolo shares his story of 27 years of substance abuse, three years in state prison and his recovery. The presentation is an honest look at the violence and insanity in the world of addiction and how it can destroy the lives of the most promising youth. Earlier in the day, Herkimer College will host a separate session with Bartolo for several local high schools. Bartolo established There and Back, Inc. and is dedicated to reducing drug and alcohol abuse among students from elementary school to college with an emphasis on student athletes. For more information visit www.kenbartolothereandback.com. The departments of Admissions, Athletics, Counseling and The Center for Student Leadership and Involvement are sponsoring the events. 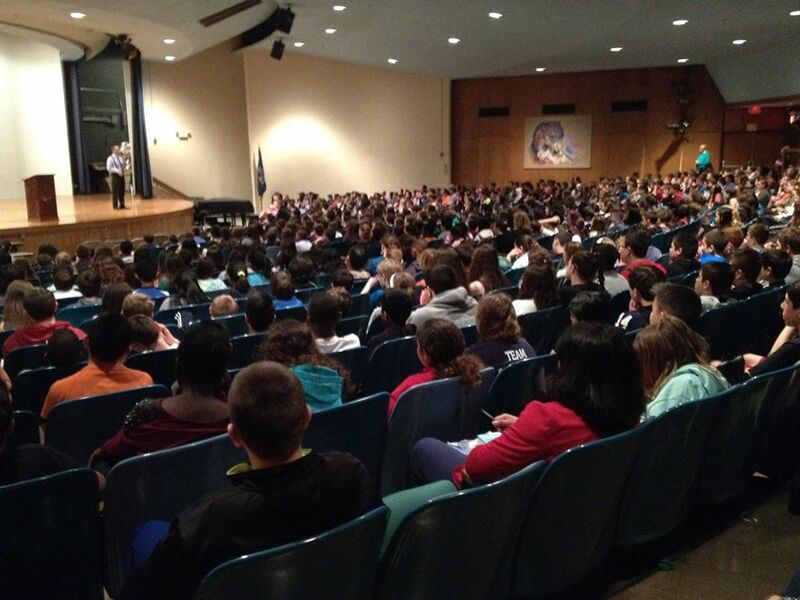 COLTON – Colton-Pierrepont Central School students were introduced to motivational speaker Ken Bartolo on Friday morning by way of an hour-long presentation. Long before Mr. Bartolo began his mission of spreading word about the dangers of alcohol and drug abuse, the Syracuse resident was sitting in a very similar spot as CPCS students were yesterday morning. BATAVIA – Ken Bartolo’s story titled “There and Back” could be expanded to add “there and back” a few more times. That’s because the former two-time all-county and collegiate sports star traversed from relapse to recovery a number of times. He shared his story to student athletes and their families Tuesday at Batavia High School. He started by asking how many of the kids planned to go on to college. Hands sprang up from about half the auditorium. He would have though the same when in school. By ninth grade, Bartolo was the best athlete in his class. His future was “as bright as it could be” and he was on his way to be a football and lacrosse leader. Then some kids – the cool kids – offered him pot. He had never smoked before, but caved in to the pressure and took one hit. He was caught by his varsity coach and was kicked off the team and out of school. His talent earned him a chance to continue playing lacrosse, but he broke his back. Doctors put him on the prescription tranquilizer Percocet. Prescription drugs kill more people than alcohol and illegal drugs do, he said. With two broken vertebrae he went on to play at Liverpool High School near Syracuse while living on Percocet. His father got him transferred to Jamesville-Dewitt, where he had “the best two years, and the worst two years.” While his athletic career flourished, he partied and drank heavily. He wondered how the kids who didn’t drink could just be themselves as he struggled with self-hate. He won athletic awards and, due to excessive partying, earned a cumulative grade point average of 2.3. Scholarship opportunities vanished, so he went on to junior college with intentions to go onto another school. He was enticed to do cocaine. His friends were collegiate all-stars as he was making a living by loading trucks at UPS. His coach got him into Nazareth College, where he experienced more athletic highs and substance abuse lows. After a weekend binge, his coach forced him to attend practice and run sprints. It was the third time that he puked when the coach said he needed help. Bartolo still denied that he had a problem. As his status was edging near a first round draft pick, he left for Atlanta, Georgia. By then he was doing heavy duty drugs and resisted friends who tried to help. He ended up being arrested and going through withdrawal. He woke up to learn that his heart had stopped for 30 seconds. Through an agreement to attend St. John Fisher College, he agreed to go through detox and make a clean start. He stopped drinking and drugging and played well for the season. After the last game he figured that he had fulfilled his promise, so he could go back to alcohol and drugs. By the age of 25, the two things that he loved the most “meant nothing to me.” All he cared about was drinking, popping pills and doing cocaine. He eventually added steroids to the mix, but that ended after he was kicked out of a gym he operated with friends. Enter crack cocaine, which lured him for seven straight days at a cost of $11,000. “Mr. All-American boy was homeless and panhandling,” he said. He’d collect enough money to buy drugs and booze. It all caught up to him – again – after he was driving while impaired. He blew a 1.8, which is double the legal blood alcohol limit, and was arrested and sentenced to three years. Since the only drug one can get in prison is heroin, that’s what he moved onto. His story includes a suicide attempt and other close calls. He survived even though at times he wanted to die. For once, when he was at the bottom of his life, he prayed and asked for help. They were the most important words he’d ever spoken, he said. He then learned about spirituality, how to contribute to life and help others. He learned that only through looking outward did he gain a sense of his own worth. Batavia Athletic Director Mike Bromley said he invited Bartolo because there has been a lot of talk about kids using vaporizers and other smoking tools.